About the Winery: Nicolaus (Nicky) and Gaby Hahn settled in Monterey’s Santa Lucia Highlands in the 1970s, on land originally used for livestock grazing. Strolling along the rolling hills, Nicky saw so much more potential for the beautiful land that surrounded him. In 1979, the Hahns purchased what is now the Smith and Hook vineyards and just one year later they celebrated their first vintage of SLH wines. Eleven years later, in 1991, “Nicky led the charge to establish SLH as an American Viticultural Area.” Today the Hahn estate includes four SLH estate vineyards, totaling 650 acres — all of which are sustainably farmed. About the Vineyards: While the Hahn estate also owns vineyards in Monterey’s Arroyo Secco AVA, used in the third tier ‘Hahn Monterey County’ line of wines, the heart and soul of the winery seems to have stayed in the Santa Lucia Highlands. The four SLH estate vineyards are the Smith, Hook, Lone Oak, and Doctor’s vineyards, and it is from each of these vineyards that the winery crafts their highest tier, single-vineyard Chardonnays and Pinot Noirs. As I mentioned, these vineyards are sustainably farmed — in fact they’re SIP (Sustainability in Practice) Certified (and one of the founding fathers of this notion). What this means is that everything from vineyard management to employee care are kept at a constant high standard, recognizing that the health and future of the vineyard and winery ranges from rootstock to fingertips. About the Wines: Hanging out at Hahn alongside Paul would be incomplete without a wine tasting. I was able to taste each of the single vineyard Chardonnays and Pinot Noirs as well as the SLH “blends” of each varietal, which is a combination of each of those single vineyards mentioned above. Tasting each vineyard side-by-side, one can truly taste the difference between the wines’ sources. For example, when it came to the Lucienne Smith Vineyard and the Lucienne Lone Oak Vineyard Chardonnays, Paul informed us that each wine was made exactly the same way, regarding percentage of malolactic fermentation, barrel type and aging. So the only difference was the vineyard source. If I were to taste the two blind, I’d assume completely different winemaking techniques were in play. The Smith Vineyard Chardonnay has such a floral, perfume-y nose, that even the aromatics were quite round (if smells could have a texture), with dominant fruit scents of apple and pear. The palate was just as smooth and soft as you’d assume based on the nose, making you think full ML (it’s not) and lengthened new oak aging (again, not). The acidity is subtle at first, amplifying slightly toward the finish, leaving just a bit of texture on the tongue. The Lone Oak Chardonnay, on the other hand, presented a much more subtle nose of stone fruits and pale flowers. Again, the palate was soft, but the acid hits a lot sooner (about a quarter of the way through), as did the texture, revealing flavors of soft nuts (like cashews) and a bit of a baking-spice-kick toward the finish. Still supple, but a lot more savory. So what’s the difference? Hahn’s Smith vineyard is located at about 1,100 feet elevation and receives more consistent sunlight throughout the day. Thus, the plant respirates (much like in the process of malolactic fermentation), giving the grapes a perceived sweetness and the softer, rounder texture. Lone Oak, however, is located at a much lower elevation, receiving less sunlight and, because of its position near the valley floor, sits in a bed of fog for much of the day. Thus, the acidity in the grapes are much higher, and one doesn’t sense the “perceived sweetness” of the higher elevation vineyard. More Info: Looking to find the Lucienne line of Hahn wines? While they may be available in some shops (look higher up and note the different logo), and you can definitely purchase them on the Hahn Family Wines online shop, I’d be remiss if I didn’t mention the winery’s new tasting room in downtown Carmel. Here, guests can stroll in, with or without an appointment, any day of the week from 12pm to 6pm to taste a full line up of what Hahn has to offer. 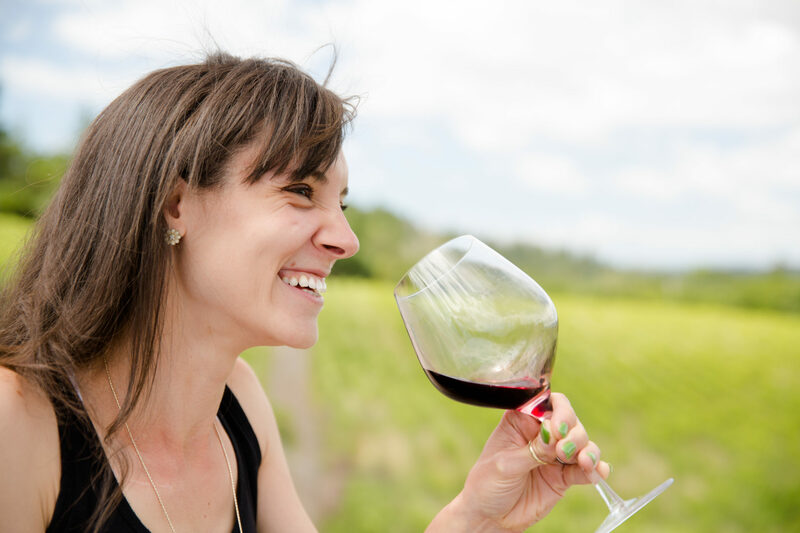 This includes their SLH series, their single-vineyard Lucienne series, as well as a few tasting room exclusives such as the Smith & Hook Cabernet and Bordeaux blends and even some Blanc de Blanc bubbles. For more information about Hahn Family Wines and to schedule your visit to either their Soledad estate winery or their Carmel tasting room, please visit the Hahn Family Wines website.